The first decision you make before you start a blog is to decide which blog platform you are going to use. Working with different blogging platforms can be challenging. Each platform has a set of rules to which bloggers must adhere. The choices range from platforms that are free such as Blogger and WordPress.com to ones that you are required to pay a monthly fee such as Blogger.org and TypePad. According to Darren Rowse's informal poll at ProBlogger.net about the platform most people use, WordPress.org is the most popular. Danny Brown of Blogging for Bloggers the most popular platform for beginning bloggers is Blogger (which is also referred to as Blogspot). In the blogging world the WordPress platforms can be confusing for beginners. First of all, there are two WordPress platforms, which makes it a bit ambiguous as to which platform does what. Blogger.com is the free platform. Blogger.org is a platform for which you must pay a fee to use. The former has many more options to control what you do on the blog. Many beginning bloggers opt for the free platforms WordPress.com and Blogger. The two are vastly different with respect to the options they offer. Both free platforms, WordPress.com and Blogger make it easy to set up your blog. Setting up the blog in both platforms require similar actions, with the exception of the html code option, which is only available at Blogger. At Blogger you have two ways to set up your blog. You can opt for using an html template, or you can opt for using page elements. The former requires a bit of html code knowledge and the later is more simple, requiring only that you click and drag page elements to design your blog and add gadgets to create more options for your viewers. You can switch back from one to another, but when you do this it gets to be a more complex process. Many bloggers want to include advertisements on their blog because they can earn income that way. Blogger allows third party advertising, while WordPress.com does not (WordPress.org does allow it). This is a major drawback for using WordPress.com. Logical reasoning provides an answer as to why one lets you advertise with third parties and the other doesn't. The most popular advertising platform – Google Adsense – is owned by Google. Google also runs the Blogger platform. Google wants you to use their advertisements on your own blog because they get a significant cut of the income from the ads. Blogger also permits you to include ads from other companies such as LinkWorth and Infolinks, which they do not receive a cut for. This is a plus for the Blogger platform. WordPress.com has a set of terms and conditions that prohibits third party advertising on their blog platforms. To be sure, you can promote your own products by linking to them, but not the products hosted by a third party. WordPress occasionally will put their own advertisements on your blog, another drawback of WordPress.com. Posting on both blog platforms is easy. The posting window looks similar to a word processing program, and work similar to one, too. 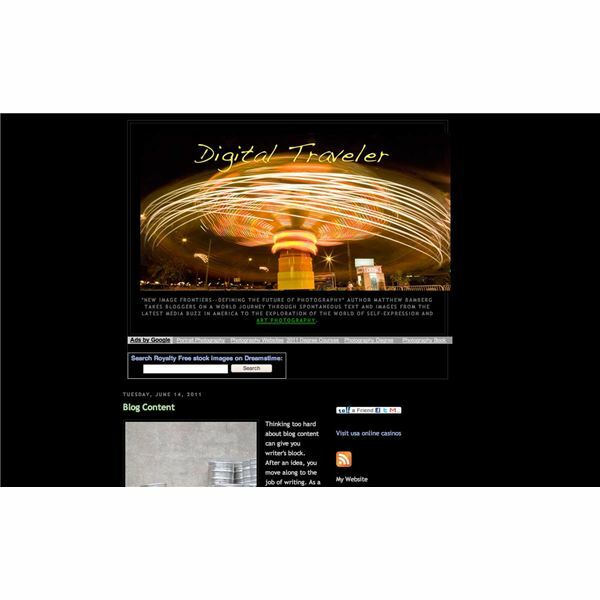 Both platforms offer posting options with html code or by looking at the post visually. Both platforms also permit you to type in what you want to write and add images by clicking a button to access them from your computer. In terms of uploading images, WordPress can be unpredictable as to where the images are placed on the page (WordPress.org functions much better when posting images). Blogger's platform is much more stable regarding images. After a post is published most of the time your images end up in the same place as you included them in the window of your post. Blogger and WordPress.com are visually different. The main difference comes when you stretch out the window in which the blog is contained. The text in Blogger blogs doesn't expand when the window does, so that you get a good amount of blank space on either side of the blog when it is stretched. A WordPress.com blog's text expands when the window is stretched, making it look like a better presentation. Another nice aspect of a WordPress blog's presentation is that the platform offers templates in which the titles of the blog posts are highlighted with a graduated neutral color and underlined. Also, in some templates, the posts are enclosed in a little neat white rectangular outline. It's a dice throw as to which free platform you end up using Blogger or WordPress.com. If you want ads, use Blogger. If you want a nicer presentation and don't care about ads, use WordPress. Google Chrome OS Inherits the Play Store. A Match Made in Heaven? Looking For a Cheap Mobile Carrier? Check Out Google Fi. Android Devices Threatened by Oracle Java APIs?